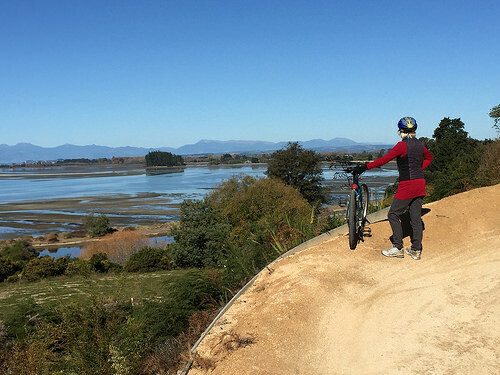 As a destination, New Zealand has a wide range of offerings to suit every season. So, one of the most common questions we get from clients is this: What season should I visit in? Spoiler: it’s probably not what you think. When it comes to tourism, the summer is routinely pushed as being the best time to go on holiday. After all, if there is one thing that we all wish for on vacation, it’s great weather! But in the case of New Zealand, we usually recommend against this. Autumn is the ideal season to travel around New Zealand, and this post will explain why. The high season of tourism in New Zealand is during the summer months, whilst the winter season sees a sizable influx of skiers and snowboarders in the Queenstown area. Spring and Autumn in New Zealand are the ‘shoulder seasons’ as they fall in between these main peaks. For more information on this, you can check out our dedicated seasonal guide. So, key tourist spots will be much more crowded, there will be more traffic on the roads, and accommodation will book up incredibly fast. In fact, for especially busy areas such as Queenstown and Fiordland, you may need to book accommodation up to a year in advance of when you are visiting. For some travellers, this might not be much of a concern. But if you are someone who really likes to get away from hustle and bustle during their travels, this will be much more difficult during the summer. 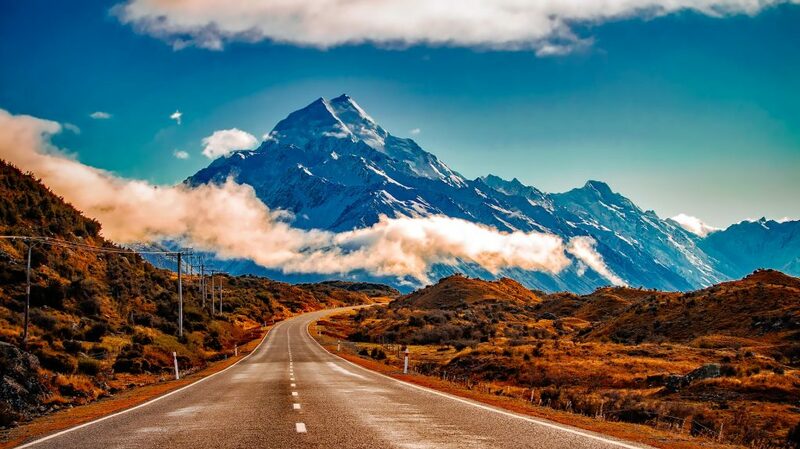 Visiting New Zealand during the Autumn allows you to skip out on the local traffic of New Zealanders on holiday, and a lot of overseas visitors as well. We experienced this for ourselves on the West Coast – so we can guarantee that it gives you a much more peaceful vacation! Top tip: It’s a really great idea to look up school holiday dates when you plan your trip, as schools also give two-week holidays at the end of each term. This helps you to avoid the times where there’s likely to be more local travellers around. Most of us know that peak season equals ‘expensive’ when it comes to accommodation and flights. We’ve already mentioned that you’ll have to be a lot more organized with booking places to stay in the summer months. However, you’re also likely to pay more as well. Remember: prices always get pushed up when demand is higher! This is especially the case with providers such as Airbnb, who have grown in popularity in New Zealand. This means that flights are more expensive (and they usually aren’t cheap to begin with). By comparison, the Autumn is when New Zealand’s seasonal price hikes start to drop along with visitor numbers. It’s true that the ‘shoulder seasons’ are more popular than they used to be. A lot of this is due to Tourism New Zealand encouraging people to holiday in these times to take pressure off infrastructure during the summer. However, it’s still noticeably cheaper to travel from March onwards. New Zealand could have been a case study for the saying ‘four seasons in one day’. Visitors are often surprised by how volatile the weather can be! As a small island nation with mountains and coastline very close to each other, any sort of weather system can be thrown at you at any time. This can mean fierce southerly weather systems which skirt up from Antarctica, bringing massive squalls and temperature drops to the South Island. It’s not unheard of for a sunny, 30-degree day to end with lashing rain and 6 degrees! So, travelling in the summer certainly doesn’t guarantee you perfect weather. In many cases, Autumn is actually a more pleasant season in New Zealand. Granted, you will likely experience cooler mornings and evenings at this time of year. But it’s also much drier in areas like the West Coast. In the North Island, you’ll also avoid the often punishing summer humidity. Best of all, you’ll still get those sunny days! Believe it or not, the photo above was taken in April 2015. The only indication that it’s Autumn is the extra layer of clothes I’m wearing! 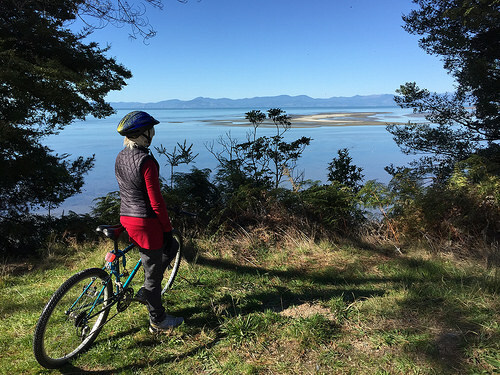 If you are wanting to get into some outdoor recreational activities like hiking or cycling during your visit, it’s actually a lot more enjoyable at this time of year. Summer heat definitely makes exercise hard work! The New Zealand sun is strong, and the UV levels here are some of the highest in the world. This relaxes a bit in the Autumn months, so you are far less likely to end up with sunstroke! The turning of the seasons is an incredible sight, and New Zealand is no exception. 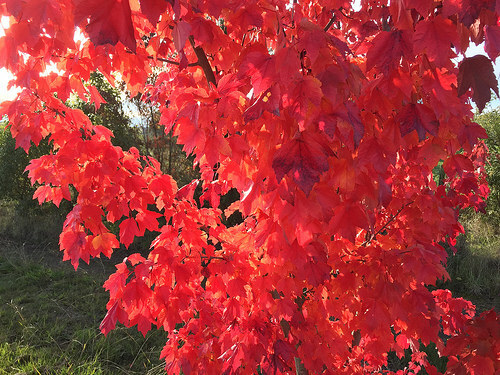 The sight of the golden and red colours of Autumn make self-driving tours of New Zealand such a pleasure! 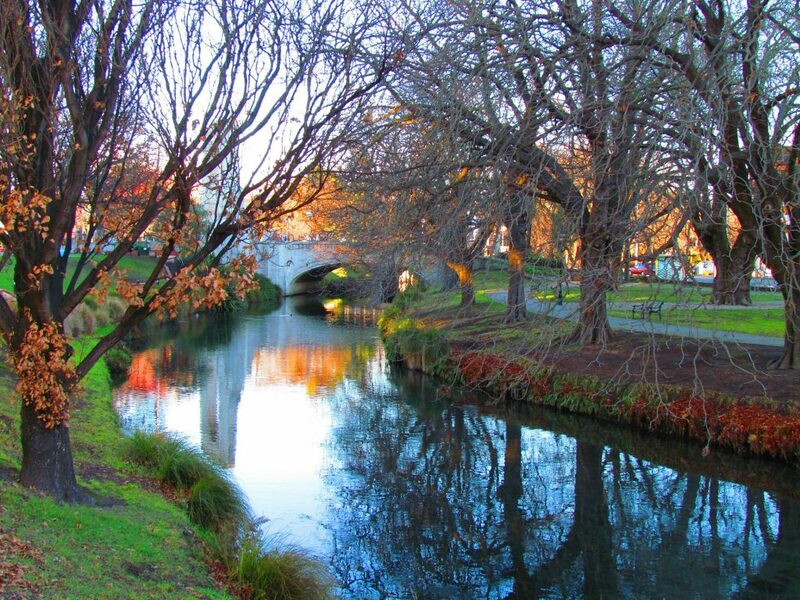 You’ll find the best Autumn scenery throughout Canterbury and Otago, the regions with the most deciduous trees. You’ll also be visiting just in time for the first snowfall on the southern alps! This usually happens in late April or May, which makes for some incredible photos. Because New Zealand’s mountains aren’t especially high, most don’t keep any snow during the summer months. If you really want to experience the snowy vistas of the New Zealand tourism ads, Autumn is the perfect time to visit. 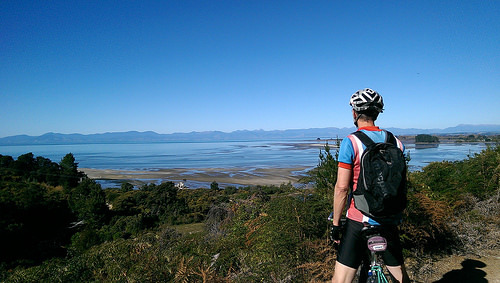 You probably won’t meet many cyclists in the Autumn in Nelson/Tasman, or in most parts of New Zealand for that matter! Where else can you get this all to yourself? 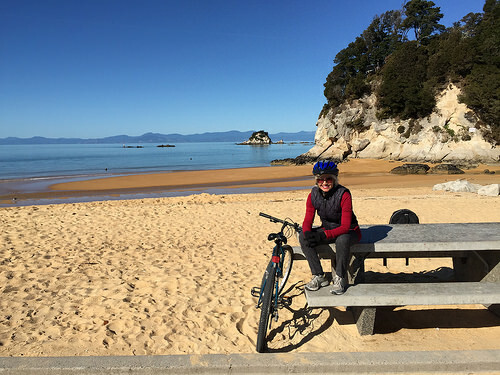 In the summer season, the golden beaches of Kaiteriteri are packed with travellers. In April, they are almost completely deserted! This is something you will see across New Zealand during the Autumn. It’s one of the best things about the season! Tomorrow: another perfect day exploring New Zealand in the Autumn! Pam – couldn’t have said it better. We love autumn, like you say weather much more settled – sure little cooler but sun still shining and hardly any people around so all those “hot spots” you get to enjoy without jostling for the best position. 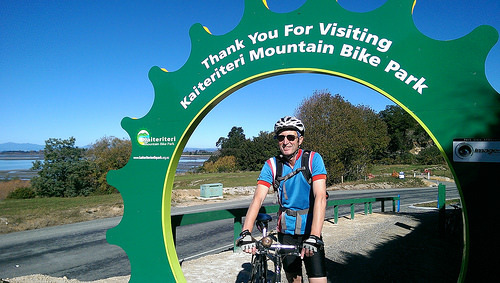 That bike ride looks awesome – well done you, the downhill looked well deserved! Yes Jan it’s certainly very pleasant to have a bit more personal space around you. I love autumn. we have traveled during that time and loved it. Great article and nice pictures. Thank you for your comments Marc. Although we love the summer buzz of happy travellers, it is very relaxing to travel in our shoulder season as you get a sense of seclusion and there’s more availability for good accommodation. The light is also denser and that’s good news for photographers. Each Autumn seems to get better every year. It really is a big fav and just when salads are getting quite tedious, it’s a relief to see apples and pears coming onto the market. And of course red wine slots into place very nicely. Hi Pam – it looks fabulous! Totally agree – autumn is a fabulous time to travel – warm days, no crowds and fabulous colours. Spring is equally good – days are warming up, trees and bulbs bursting into life, wee lambs everywhere, not too many people travelling which means no queues and lots of accommodation choices with vacancies! Actually Rose, you make a very good point about travelling in Spring with the trees plump with blossom.It’s the accommodation choices that are so appealing for both these seasons.